Below you will find many ways to make jewelry, different jewelry projects to make for kids and other beaded jewelry crafts for children to make on their own jewelry such as beads, bracelets, necklaces, rings, earings, etc. How to Make Jewelry Instsructions for Children includes activities & projects such as bracelets, necklaces, rings, earings, decorative pins, beadsetc. Make these beautiful pieces of jewelry by looping paper clips together. If you are looping a necklace together, you will need about 25 - 30 paper clips. To make a bracelet, obviously, you will need a lot less. Get decorative paper, wrapping paper, or magazines out and cut out 1 inch by 1 inch squares. Then cover the center of each paper clip with one of the squares that you cut out. Secure it with glue. When your bracelet or necklace is completely covered then you should coat it with clear glue (glue that dries clear). To make it really sturdy, do this several times ... wating 30+ minutes before reapplying. This will keep your necklace or bracelet wearable for years to come. Your Mom will love this thoughtful gift...I am sure of that. When you are playing Indian, pirate or gypsy, you will want to have an earring for your costume. You can make different kinds of earrings from paper clips. Stretch the clip out and bend it into a new and interesting shape. Bend them inwards or outwards so that they don't stick you. You can wrap silver or aluminum foil around it, or string a button or bead on. 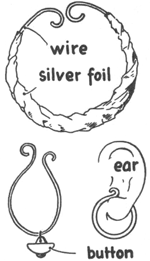 Then just slip it over your ear lobe (Do Not Stick These In To Your Ears). These are meant as Clip-On Earrings in that they DON'T go through an earring hole. Make a Locket Necklace - Just buy a hinge, glue some photos on it and place it on a chain and you have a beautiful locket...why buy an expensive one when you can make one within a few minutes. How to Make Mini Paper Fan Earrings for the Chinese New Year - Let’s make a pair of earrings (you’ll need a little help on step # 4). These will be made of paper and will have two very important Chinese symbols : the fan and the cherry blossom. Make Baby Doll Earrings - Learn how to make a pair of baby doll earrings with ribbon, beads, etc. Make Mom Jewelry Gift : Necklaces and Bracelets by Making Paper or Fabric Beads - Did you know that you can make beads out of paper and / or fabric material? Well, you can. Make a Necklace Gift for Mom or Grandma on Mother’s Day - All Moms love jewelry made by hand from their babies (no matter how old you get, you will always be your Mother’s baby). Here is a necklace arts and crafts project for kids. This jewelry is made from colorful cardboard, stiff paper, or construction paper. This makes a great, colorful, and thoughtful gift to make for your Grandmother or Mother. Make Mom Jewelry Gift : Necklaces and Bracelets for Mother’s Day - This is a cute idea for kids to make jewelry, such as bracelets and necklaces for Mom, Grandma or an Aunt on Mother’s Day or a birthday. Girls especially seem to love this arts and crafts project because many girls love to sew with needle and thread and they love making and wearing jewelry. Either way, this is a lot of fun. Making Pom Pom Party Earrings - These are party pom poms that we made for a New Years Eve Party. Find out how to make them with the following tutorial. Make Mom a Plastic Straw Necklace - It is time to start thinking about making your Mom a gift. How about trying to make this pretty necklace for mother that can be made out of simple plastic straws. All you need is some yarn and some straws and some love for your Mom. The simple instructions follow. Making Spider Pendants - Learn how to make these spider pendants / jewelry. Make Wood Rings - This is a terrific craft idea for woodworking class at school or for Summer Camps. Coin Earrings - Learn how to make coin earrings - a great craft for travelers coming back from a foreign country...remember your vacation forever. Leather Rings - Learn how to make leather rings. Coin Necklaces & Bracelets - A lesson on making coin bracelets and necklaces out of coins from different countries...great after travels to foreign lands.